Kitchen Expansions | Sarnia | Carosyl Home Additions Inc.
Family meetings. Homework. Happy hour. These days, the kitchen isn’t just a place to cook and prepare meals. The kitchen has evolved to wear many hats, and now plays a very important role in the social aspect of our lives. However, if your kitchen lacks adequate real estate, it might not be the hub of activity you want it to be. The single best way to revamp your cramped space is by extending your kitchen onto your property, and that’s where we come in. 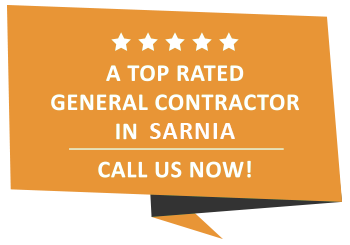 At Carosyl Home Additions Inc., we are a full service general contracting company offering kitchen expansions to the people of Sarnia and the surrounding areas. Increase your living space with Carosyl Home Additions Inc. Extending the square footage of your kitchen onto your yard is an extremely labor-intensive job, which involves meticulous planning and execution. At Carosyl Home Additions Inc., we strive to bring value to your kitchen expansion project by implementing the most efficient and cost-effective techniques possible. In addition to expanding outward, we can also get you the space you need by knocking down a wall and extending your kitchen into other areas of your home. The kitchen is often referred to as the heart of the home, and at Carosyl Home Additions Inc. we would love the opportunity to show you that! When you partner with us, you will have highly experienced and certified contractors working on your home, from start to finish. Our day isn’t done until you are completely satisfied with the look and feel of your new kitchen! If you are anywhere in Sarnia and interested in talking to a professional about your kitchen expansion ideas, we encourage you to get in touch with us today. We are looking forward to hearing them!